This chair massage pad will transform any chair or car seat into your personal masseuse! Nowadays it’s common to spend a big portion of your day sitting, whether it’s in an office, car or at home. This can cause havoc with your back and leave you feeling sore, tense and stressed out. Lanaform have the ultimate solution to those aching muscles that you can experience wherever you are! 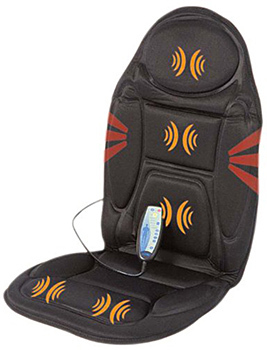 Their massaging chair pad has adjustable straps that make it quick and easy to attach to any chair – even in your car. The 5 massage motors offer a fully customisable experience that will relax you like no other. Using the handy remote control, you can change the speed, pattern, area and duration of the vibration to your liking. There is also a heating option that will further relax your muscles and create a pleasantly warm sensation. It can be attached to either mains power or to your car’s cigarette adaptor; perfect for long journeys! There are two different modes so that you can either select just the right settings to treat those nagging aches or leave the back massager to do the work for you on automatic mode. This mode offers a sequence of different massage, providing variety and letting you sit back, relax and enjoy. If you wish, you can also vary the time, speed and heat functions to your liking in this mode. 1 x massage chair with power cable and car adaptor. Instruction booklet.